EUROPEAN Tour star, Greig Hutcheon, has won the first professional tournament to be held at the stunning, new Colin Montgomerie-designed Rowallan Castle Golf Course. Fresh from fantastic performances in the BMW PGA Championship and Welsh Open European Tour events, Hutcheon shot a brilliant 66 to take him to seven-under par and lift the Skycaddie Challenge. 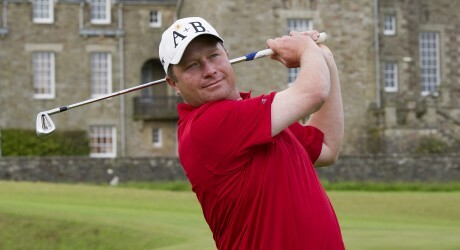 Thirty-seven year-old Hutcheon, from Banchory, is currently Scotland’s top professional golfer in domestic competition. He won the Tartan Tour Order of Merit last year for the third time. After his win at Rowallan Castle, he is on course to achieve his goal of lifting that title for a fourth time. Hutcheon said: “I’ve enjoyed my first two days here at Rowallan Castle. The Colin Montgomerie course is a great design. It has an interesting mix of treacherous par threes, reachable par fives and a couple of driveable par fours. A highlight for me was the fantastic 12th hole. Hutcheon clinched the title after rounds of 69 and 66 to win by one stroke from Jason McCreadie of Buchanan Castle; with first day leader, Stephen Gray, of Hayston coming in third. The Rowallan victory caps a fantastic three weeks for Hutcheon. He made the cut in both the Saab Wales Open and the prestigious BMW PGA Championship at Wentworth. Hutcheon picked up more than £1,000 for his one stroke victory at Rowallan, taking his earnings for the last three weeks to nearly £30,000. This is the first major Scottish event to be staged at the picturesque Rowallan Castle parkland course that is fast gaining a reputation as one of the best courses in the country. Set in 600 acres of one of Scotland’s most glorious country estates, the challenging 7,000-yard Rowallan Castle course designed by 2010 European Ryder Cup winning captain, Colin Montgomerie, wends its way past two historic castles, and enjoys superb views of the famous islands of Ailsa Craig and Arran. Rowallan Castle Golf Club is Colin Montgomerie’s first Scottish golf course design. Rowallan Castle is a Members Golf Club; however, a limited number of visitor times are available. MEDIA RELEASE posted by McGarvie Morrison Media. You too can post media releases (aka press releases) on allmediascotland.com. For more information, email here.